AP Racing’s Radi-CAL racing calipers have taken the racing world by storm, dominating the highest level racing series on every continent. Whether it’s open wheel, stock car or endurance racing, Radi-CAL dominates. The pressure forging process results in a strong, stiff caliper that is 20% lighter than similar cast calipers. Each caliper has been tested with over 500,000 cycles of pressure and torque to meet AP’s stringent quality standards. The non-symmetric design saves weight without compromising strength and stiffness. 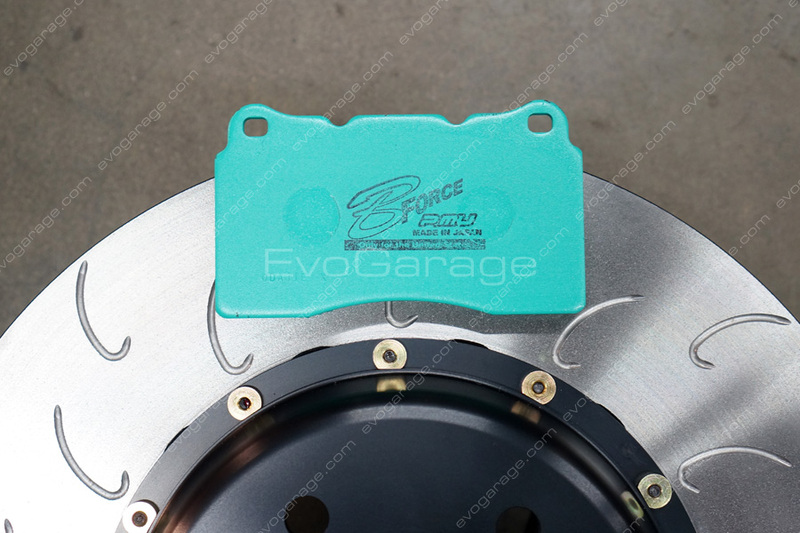 Calipers are double sealed and hard anodized aluminum pistons are differentially sized to maximize pad life. A removable forged bridge allows for easy pad changes. The rotors at 36mm wide provide extra air gap for cooling and increased thermal capacity without increasing weight. 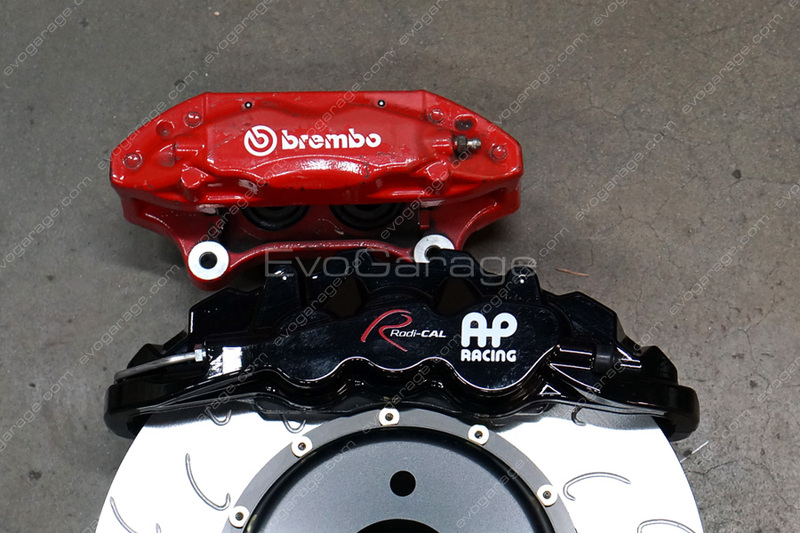 The JDM DC5 Brembo is so tiny compared to these AP Racing Radi-CAL calipers. 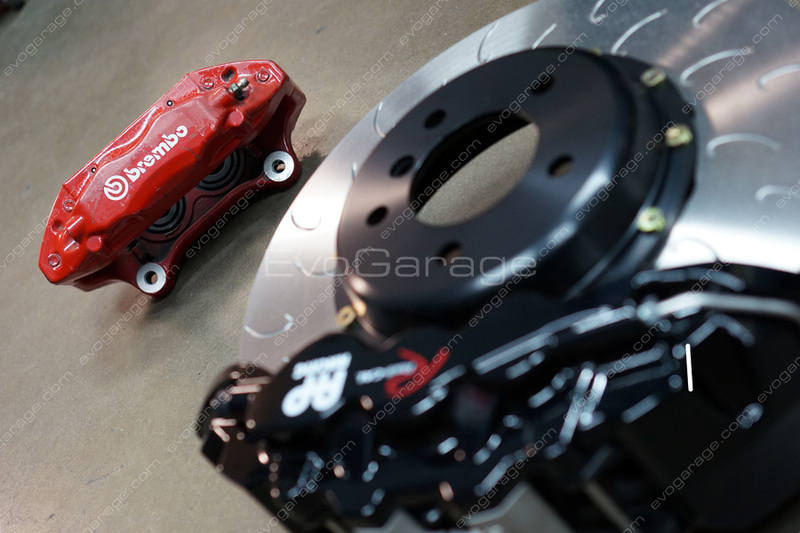 Mitsubishi EVO X brake pad placed on these AP Racing rotors for comparison. Coming from AP Racings incredibly successful race Radi-CAL caliper; and after years of development, AP Racing has released their new pressure forged aluminum Radi-CAL caliper line for high performance road use and weekend track use. Using the latest industry software and brake dynamometer testing, the AP Racing Radi-CAL caliper was designed to implement the latest caliper technologies learned through more than forty years of highly successful motorsports participation including over 725 F1 Grand Prix victories. Every AP Racing Radi-Cal by STILLEN big brake kit is designed specifically for the vehicle it’s being installed on. By utilizing both AP Racing rotors and Radi-Cal calipers, STILLEN engineers the specific vehicle mounting hats and brackets. These components are designed and engineered in STILLEN’s Costa Mesa, CA. R&D department and machined in STILLEN’s in-house machine shop using the latest technology in CNC lathe and mill machining. 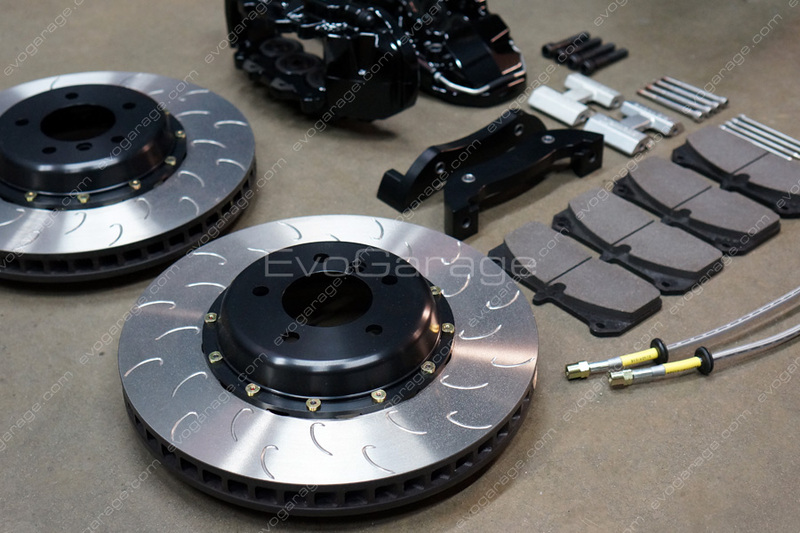 Every brake system consists of specific rotor sizes, pad selection, and caliper configuration to suit that application with the intention of developing the perfect match for that vehicle. AP Racing pressure forged aluminum caliper bodies are tested at over half a million cycles of pressure and torque to meet AP Racing’s stringent OE and high performance road use validation testing which is made to ensure maximum stiffness and durability required for use on road registered vehicles. The forged aluminum process was primarily chosen for the main reason that is 20% stronger and lighter caliper than a similarly sized caliper using a casting process. These larger, lightweight AP Racing calipers replace the much heavier cast-iron calipers that have been installed at the factory that have been designed for low cost with little regard to high performance driving. The AP designed opposed-piston design guarantees maximum stiffness for better pedal feel and immediate braking action from the drivers input. The Radi-CAL line come with both 4 & 6 pistons – the six piston caliper designs allow a larger pad area to be used which decreases heat at the friction point between the disc surface and the pad material while maintaining the same brake torque. This single detail increases both rotor and pad service life. Additionally, a larger caliper greatly aids in braking performance by acting as a more efficient lever on the rotor which in turn applies more torque to the rotor, thus increasing the force applied to the rotor. AP Racing uses proprietary cast iron alloy material designed specifically for high performance and weekend track use developed by over forty years of successful racing at the highest levels. This is the same iron metallurgy that is recognized in the Nissan GT R community as the only acceptable replacement rotor for their vehicles. Many GT R owners report that the stock O.E. brake rotors will last them about one weekend of continuous use on the race track. After switching to the AP Racing rotors, our customers noted a drastic difference with reports of being able to attend 30+ track days before requiring replacements! The rotors supplied with the Radi-CAL come in one of two configurations, J Hook or Slotted / Cross-Drilled. There are many benefits to the AP Racing patented J hook design. The main benefit is the increased durability and longevity. For many years, cross-drilled rotors were recognized as the best rotor to provide an excellent initial bite and additional grip on the pad. 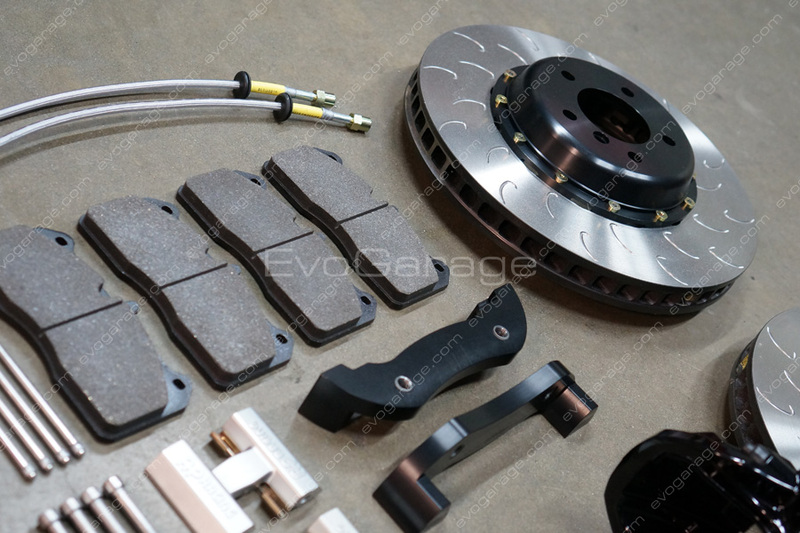 However, as the brake pad grabs the J Hook rotor, the leading edges create additional bite on the pad face and provide the driver with a much more noticeable and positive feedback in braking performance. Additionally, a drilled rotor can potentially form cracks from rapid contraction and expansion during hard road and track use caused by dramatic changes in varying temperatures of the rotors. Because the J hook machining process does not go all the way through the rotor, it prevents the rotor from forming surface cracks and therefore can withstand better the high temperatures and hard driving. Finally, the J hook finish retains all of the benefits of a traditional slotted rotor as it cleans the pad surface, and allows the pad to outgas through the recessed channels. There are many good reasons why cross-drilled / slotted rotors have been recognized as the highest performing brake rotors available, and for good reason; quite simply, they are the best. The cross-drilled holes greatly aid in cooling allowing the rotor to breath, while at the same time they add that additional bite that is needed sometime between the rotor and pad. When manufacturing a cross-drilled / slotted rotor, it is extremely important that the rotor be designed to be finished with this pattern. This means that the drilled holes must line up perfectly with the internal cooling vanes so as to not affect the overall structure of the rotor. Additionally, the holes must be precision finished with a chamfered edge to prevent stress fractures from forming which leads to a breakdown of the pad. By giving the hole a radius edge, it allows the iron to expand and contract naturally without creating a possible stress point. AP Racing Radi-Cal big brake kits have become to be known for their “race on Sunday, sell on Monday” mentality. In an era of high powered motorsports which sees very little technology making its way to the lower echelon of track and street vehicles, AP Racing has taken the bold decision to re-write the history books and bring that famous saying back. 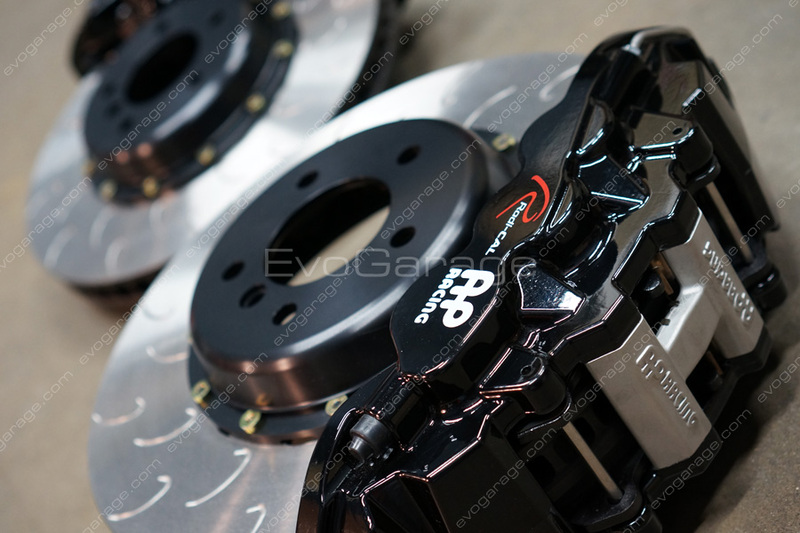 After many years of success in racing series’ such as Formula 1, NASCAR, World Rally Cross, Indy, ALMS, Le Mans, and many more, AP Racing decided to bring the World Radi-Cal calipers to the masses. 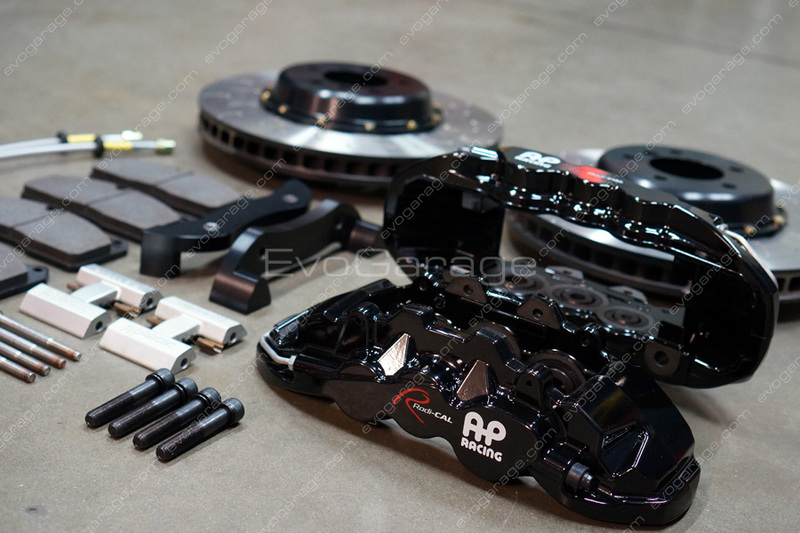 To bring this technology to the street, AP Racing once again reviewed their current big brake kit offerings and decided to improve upon every single aspect of the caliper. AP Racing race-only calipers more often than not constructed out of a single piece of billet aluminum that goes through many hours of machining and preparation. The final result is a brake system costing more than $30k. This price tag leaves them available only to a few with an enormous love of cars… and deep pockets. Therefore, AP Racing looked at all of the possible solutions and came up with using pressure forgings. The pressure forging process can be considerably more expensive than just using simple cast calipers, but the increased savings in weight and durability are well worth the compromise. WEIGHT SAVINGS – By removing material where it wasn’t necessary, and keeping the material only where it’s actually required, AP Racing has been able to remove a considerable amount of dead weight. Additionally, in going with the pressure forged aluminum manufacturing process, the caliper is about 20% lighter than if it were to be constructed out of cast aluminum. STRENGTH – By using the pressure forged aluminum manufacturing process, the caliper is also 25% stiffer than if it were to be constructed out of cast aluminum. The caliper has been designed to only have material in key structurally integral areas so as to better manage the huge loads being placed on the caliper during hard braking on both the road and race circuit. DESIGN – AP Racing wanted to build a caliper that wasn’t just structurally and technically ahead of the competition, but also in the looks department. They’ve succeeded in doing this by designing a caliper that is without doubt the best looking caliper in the big brake kit market. FUNCTIONALITY – AP didn’t want to simply build a great looking caliper that works well for the street; they wanted to build THE best looking caliper that would outperform every other comparable caliper in any environment it was placed into. To accomplish this, they paid close particular attention to how easy it was to swap out the brake pads. With the quick release pressure forged bridge pad, changes take a matter of minutes instead of hours like other big brake kits available on the market today. 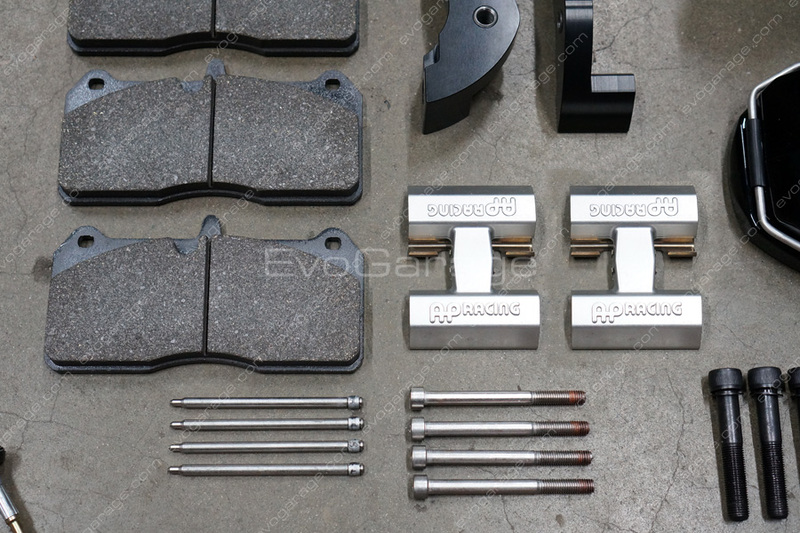 The internal seals of the caliper have been designed with extreme precision and are rated for supercars like the Bugatti Veyron, the Koenigsegg and the McLaren MP4-12C – vehicles that are put through the most extreme driving conditions and will undoubtedly see extensive high performance track use. 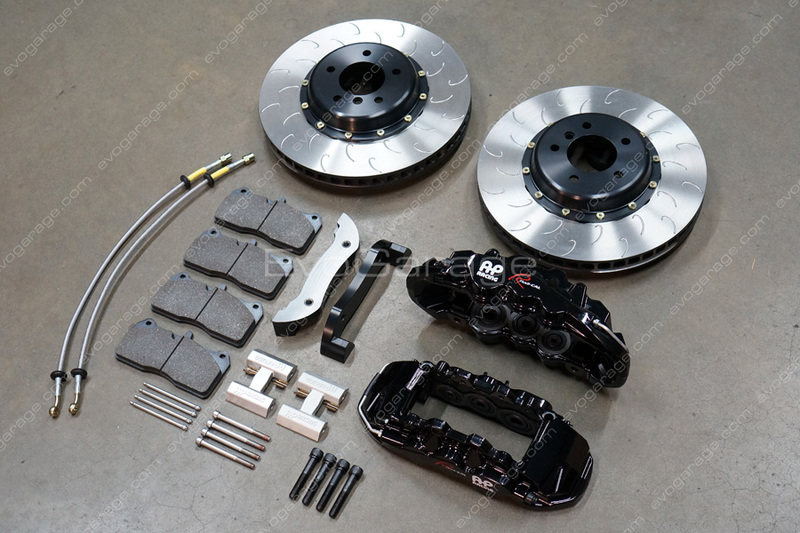 Every STILLEN manufactured AP Racing Radi-Cal big brake kit comes with everything you need to complete a full installation including the AP Racing Radi-Cal calipers, AP Racing high performance rotors (available in either J hook or cross-drilled and slotted patterns), high performance brake pads, billet aluminum mounting hats and full floating hardware (pre-assembled for easy installation), billet aluminum mounting bracket, braided stainless steel brake lines with correct conversion fittings when necessary and detailed installation instructions. Each kit’s design is based on the vehicle’s GVW, heat index required at maximum speed and GVW while maintaining brake balance for peak performance and compatibility with O.E. Anti-lock braking and stability control systems. The goal is a brake system designed to manage heat properly in the most efficient way using components designed and validated specifically for a high performance track environment and everyday road use. The result is a big brake kit that offers track braking performance that is safe and compliant for your road registered vehicle.